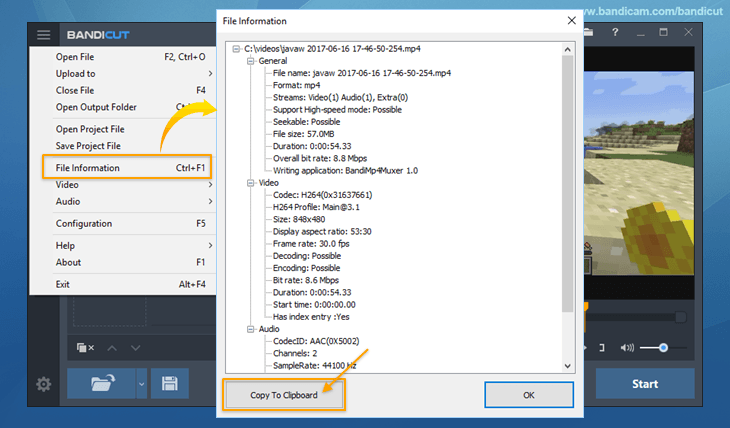 I tried the demo of this program in order to trim live .flv streams that I have recorded, but whenever I try to begin the render I am presented with an error code. I have provided screenshots of the error and previous screens. Alternative render settings to the ones shown do not work either. If it worked for this task, it seems like it could be the ideal program for me and I would be happy to buy it. Re: Getting an error when trying to render FLV file. Could you please let us know the File information of your video? Import a video file -> Bandicut menu -> File Information (Ctrl + F1) -> Click 'Copy to Clipboard'. You can now paste (Ctrl + V) the file information to bandicut@bandicam.com or the Bandicut forum.